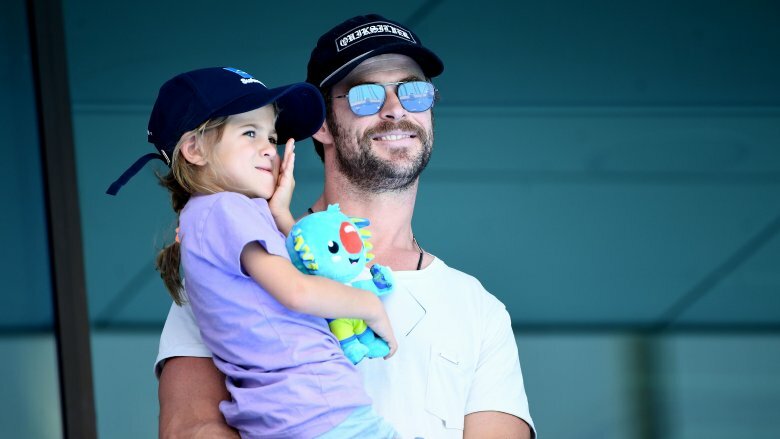 Chris Hemsworth doesn't seem to have a lot of secrets — but the star did escape down under to live a more private life with his wife and three children. According to Vanity Fair, he shipped out of Malibu following his massive Thor fame and went to the pristine waters of Australia's Byron Bay to avoid the paparazzi and live a less complicated life. "You just kind of lose touch with reality a bit [in L.A.]," he told the publication. "You drive down the street and you're constantly reminded of everything you're either involved in or not involved in. It's exhausting." It's hard to imagine Hemsworth — the kind of guy who regularly gains or loses upwards of 20 lbs. for movie roles — as being someone who tires out easily. After all, he embodies the hammer-wielding god of thunder on the big screen, and he partly grew up in the literal Outback with a dad who wrangled buffalo. But there's a lot we don't really know about the star, especially when it comes to sibling rivalry. Here's the untold truth of People magazine's "Sexiest Chris" of 2019. Today, we know Chris Hemsworth from his role in Thor, but if the actor went with his first instinct, he probably wouldn't be acting at all. In fact, a passion for cross-stitching initially made him want to be a fashion designer. Yes, the rugged outdoorsman, who once accidentally stabbed himself with a knife while fishing in the Australian Outback (instead of, you know, using something like a fishing rod), is apparently as adept with a sewing needle as he is with Thor's hammer (via GQ). Hemsworth's humble upbringings are no secret. According to his interview with GQ, he spent some of his childhood in the Outback while his dad worked at cattle ranches. The brief stints in the Northern Territory helped his family save money, but his parents still stressed about bills. Since he couldn't afford trendy clothes, Hemsworth took to sewing his own — sort of. The passion was pretty short-lived, though he maintained in a W Magazine interview that he really did love to cross stitch and had a "real sort of interest in sewing." The actor explained, "I remembered buying or getting sort of patterns for clothing and trying to make pants and things. I don't think that went very far." He added, "I think I might have sewed a leg together or something. But there was a period when I was like, 'I'm gonna be a designer!'" 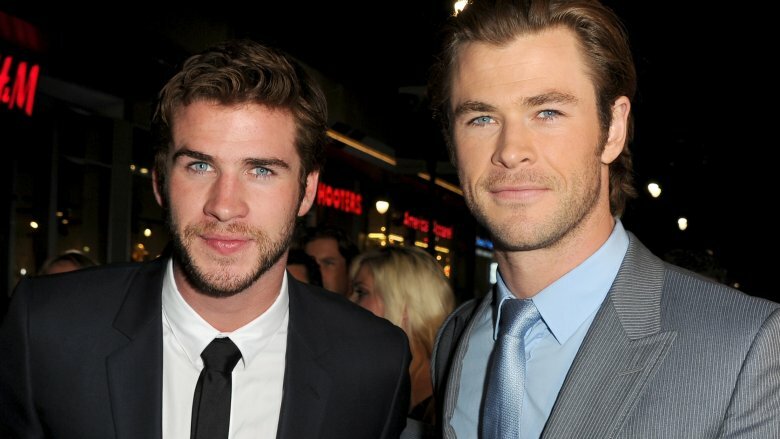 If you regularly get the Hemsworth brothers confused, you're not alone. Chris, Liam, and Luke are the epitome of Hollywood's idea of handsomeness — so much so that it's shocking the trio aren't all actually just the same super-famous person. Needless to say, the boys had quite a rivalry growing up, particularly between Chris and younger bro Liam. In an interview on the Graham Norton Show (via the Daily Mail), Hunger Games star Liam admitted that the rivalry between himself and Chris sometimes turned a little violent. Thankfully, this was before the Thor actor was slapping down his mystical hammer, or else things would've probably ended much worse. "Our childhood rivalry was a bit vicious — a bit like The Hunger Games," Liam said, adding, "We had a few incidents with weapons." During one specifically violent row, the pair were in the kitchen fighting over a toaster oven (probably because Vegemite requires a perfect piece of toast, but we're only speculating). Liam picked up a kitchen knife and threw it at Chris. The handle smacked him in the forehead. "I could have hit him with the other end if I'd wanted to," Liam continued. "It was just a warning shot." We're guessing Chris didn't volunteer as tribute for this one. Thor almost looked a lot different. 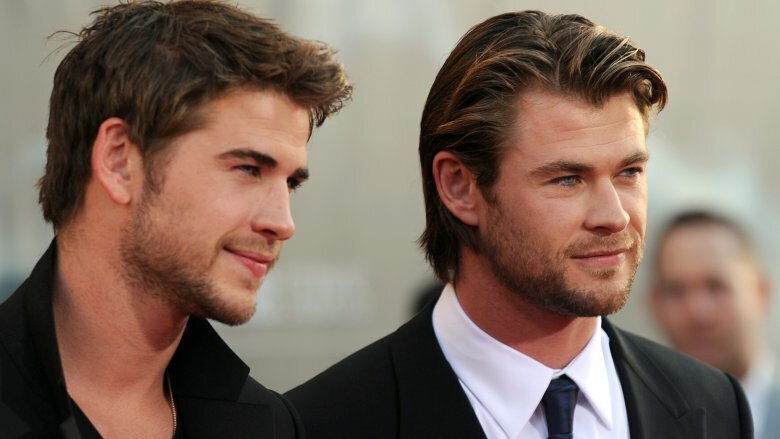 Or at least slightly different considering Chris and Liam Hemsworth have undeniably similar features — and what's the difference when you slap on a blond wig? Before Chris landed his Marvel role, his little brother nearly scooped it out from underneath him. Talk about a sibling rivalry! In an interview with Vanity Fair, Chris admitted that his initial audition for Thor didn't go so well. However, things went a lot better for Liam, who had been selected for the final four. Drew Goddard and Avengers director Joss Whedon, who both worked with Chris on The Cabin In the Woods before landing Marvel projects of their own, were confused about how his little brother could make the cut but not him. "They said, 'Why the hell aren't you in the mix?' And I said, 'I didn't get a callback,'" the actor told the publication. "And they were like, 'This is crazy.' And I was like, 'If one of us gets it, that's cool.' And they were like, 'No way. That should be you.' And when casting opened back up, Joss called Ken [Branagh, casting director] and said, 'Give Chris another shot.'" Thanks to landing a role in the Avengers franchise, Chris has since been able to take on passion projects, or, as he told Vanity Fair, "A few films no one cares about." 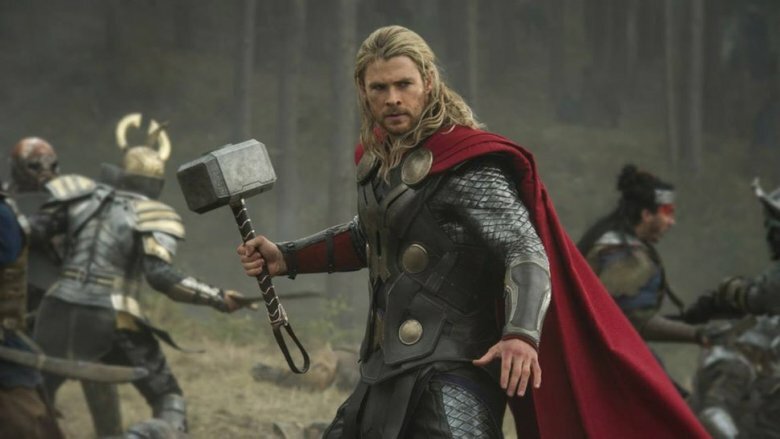 Having Thor's hammer as a permanent fixture in your home is a pretty cool perk of the job, but it wasn't Hemsworth's initial goal when jumping into the world of acting. Rather, the star wanted to help his parents out following some financial struggles. "We grew up with very little money and that kind of frustrated me as a kid listening to my parents talk about bills every week and sort of seeing the sort of weight that put on them," he told W Magazine. "I thought, 'That's it. I'm gonna make money and pay off their house.' So I thought, 'I'll be an actor,' and very naively kind of ran into that world and started auditioning." According to Men's Health, the star picked up the trade after realizing his brother Luke made $900 in a week while shooting the soap opera Neighbours. For his part, Chris ended up nabbing a Neighbours cameo of his own in a single 2002 episode, but found much more success as Kim Hyde on the Aussie soap Home and Away. Today, the actor can do a whole lot more than pay off his parents' mortgage. As of this writing, he reportedly lives in a $9 million mega-mansion in Australia's Byron Bay. Dancing with the Stars is often regarded as a fame-grab for fading reality stars and former A-listers who've since been relegated to the D-list (when Mike "The Situation" Sorrentino and Mario Lopez are the biggest things to happen on a show, that says a lot). It almost makes no sense that Hemsworth, a leading man in a major Marvel franchise, would have subjected himself to such scrutiny. However, the Australian version of DWTS actually made the superstar, who was previously known down under for his Home and Away role, a national celebrity. 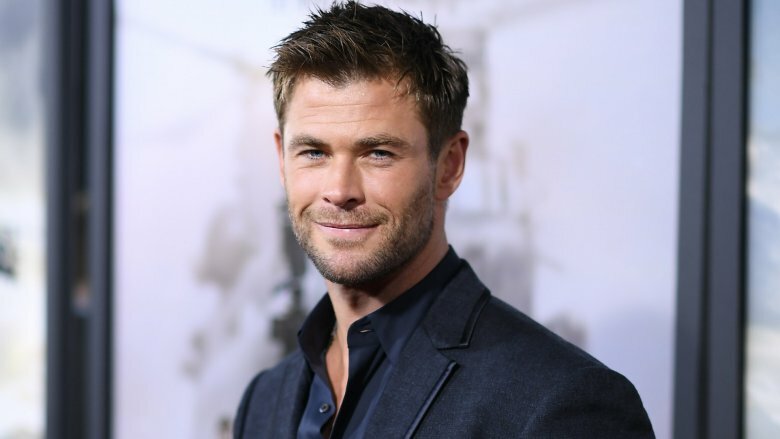 According to the New York Post, the Thor star some trouble breaking into the American market when he left the world of soaps for Tinseltown in 2007. Much like his soap character Kim Hyde — who miraculously survived a drug overdose, a plane crash, a helicopter crash, a fire, and a cyclone — Hemsworth refused to be defeated as the phone failed to ring. According to Vanity Fair, it was Joss Whedon who helped him become a bona fide A-list celeb after casting him in the campy horror flick The Cabin in the Woods in 2009. 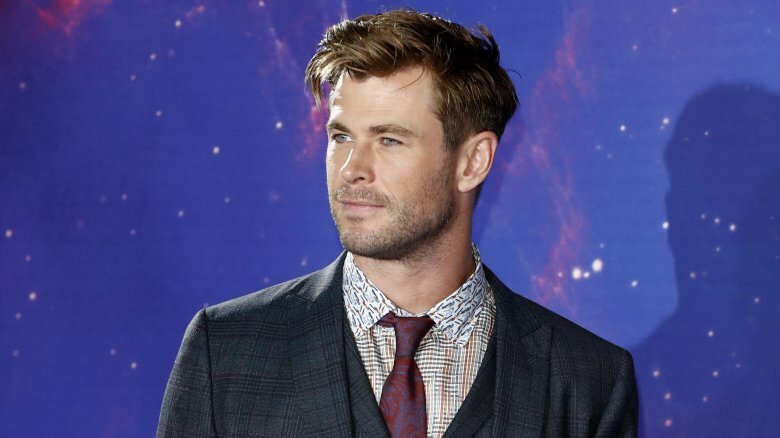 Not only did the film's success push Hemsworth into the spotlight (it has a 91 percent on Rotten Tomatoes), but Whedon himself championed the actor for his role in Thor. Hemsworth didn't have to wait too long to land a gig in L.A. According to Men's Health, the star scored the role of Captain Kirk's father in J.J. Abrams' Star Trek shortly after arriving on American soil. That's the American dream, right? Well, not so much for this movie star. As it turns out, that role was kind of his breaking point, and Hemsworth almost shipped back to Australia before he really gave Hollywood a chance. 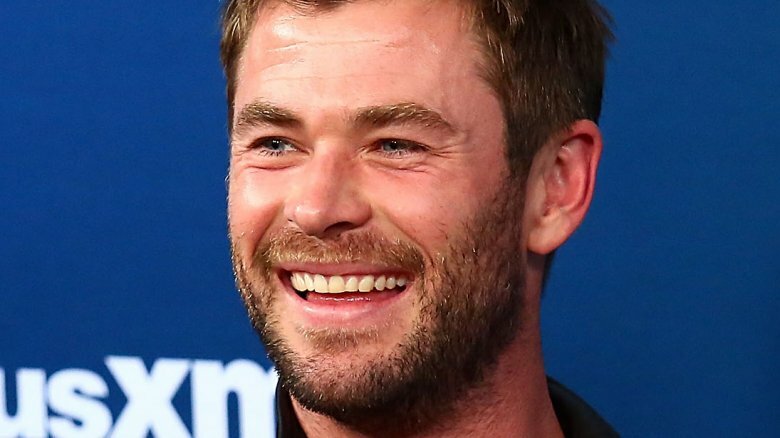 Even though Star Trek was helmed by one of the industry's most revered directors and met with a 94 percent on Rotten Tomatoes, Hemsworth struggled to land another gig. His phone stopped ringing and anxiety took hold of his career. The actor even briefly considered asking for his role back on Home and Away. "I was about to quit," Hemsworth told Men's Health. "I got more and more anxious to the point where I couldn't harness or use that energy. It was all to my detriment." Motivated by the idea of paying off his parents' home, he went on one last audition before Christmas in 2008. If he didn't land it, he'd resolved to go back home with his tail between his legs. Thankfully, the audition happened to be for The Cabin In the Woods, and we all know what happened next. 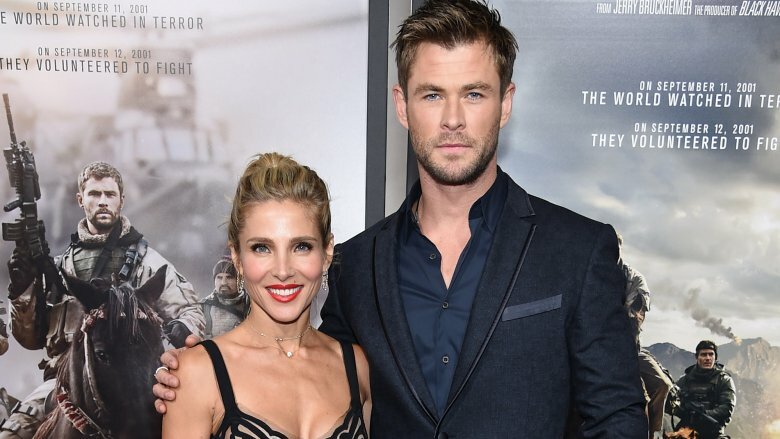 Chris Hemsworth and his wife, Elsa Pataky, sort of did things backward. The Fast and the Furious franchise actress apparently agreed to marry the movie star Norse god before he even popped the question (and honestly, we would have, too). According to GQ, the couple first met through a dialect coach, and Hemsworth proposed just nine months later. While it may have seemed sort of quick, the actor was totally over his bachelor lifestyle. 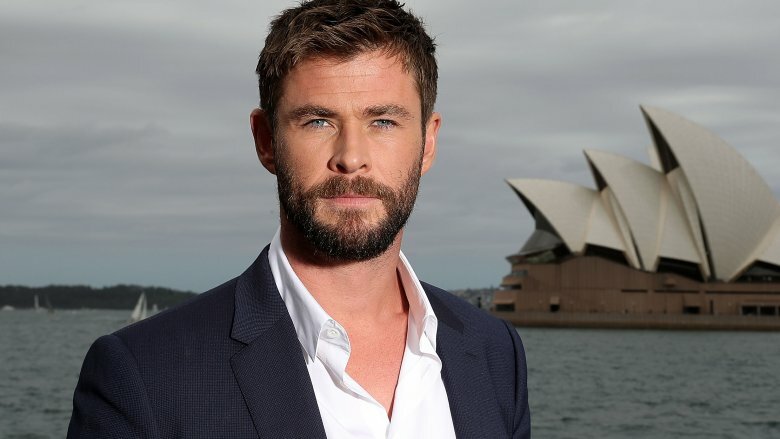 "The fame, the parties, the women — I did that stuff back home, when I was on the show [Home and Away]," Hemsworth told the magazine. The Marvel actor and Pataky have since welcomed three children, daughter India Rose and twin boys Tristan and Sasha (via E! News). Meanwhile, the Spanish starlet has always been super supportive of Hemsworth's career, and even lent a helping hand when Natalie Portman was forced to bail on a Thor reshoot. According to an interview in W Magazine, Pataky stood in for a final kiss scene, and we were none the wiser because she and Portman just so happen to be the same height. Hemsworth isn't just a superhero in the movies. In real life, he's a super dad — and he's even got the ink to prove it. While the star admitted to GQ that he's pretty darn good at changing a diaper, his adorable tattoos prove his commitment to his children. According to the Daily Mail, he and wife Elsa Pataky share matching tattoos that spell out the names of their kids in the Runic alphabet. Meanwhile, the actor also decided to permanently ink one of his daughter's drawings on his arm after she joined in on a tattoo planning session. According to Men's Health, Hemsworth was sitting around trying to create a tattoo idea with a friend who specializes in "geometry work." Nothing was sticking until his daughter woke up, walked out of her bedroom, and refused to go back to sleep against her father's wishes. Instead, she crawled onto his lap, started drawing, and the perfect tattoo was born. Hemsworth's friend "printed" out her drawings, placed them on the actor's arm, and tattooed right over the top without fixing a single line. "See how they're a little bit crooked and kind of off?" the proud dad asked the media outlet. "I said, 'Definitely don't neaten it out.' It's exactly how she drew it." We can't even handle the cute! 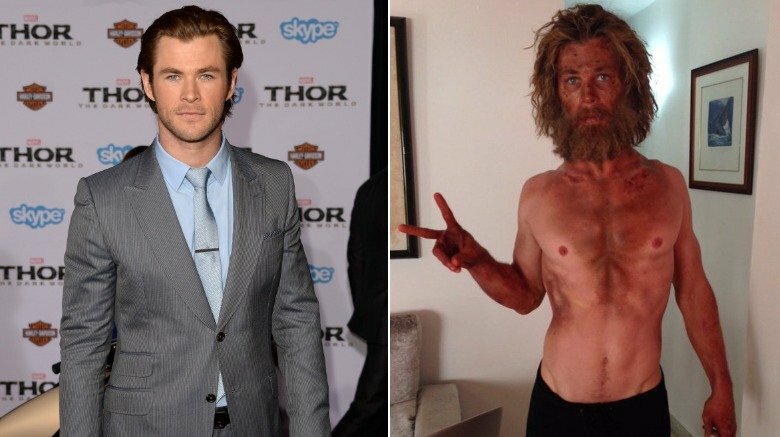 Taking on Thor was no easy task for Hemsworth. While we know him to be utterly ripped (we're almost positive his biceps are bigger than some of our thighs), this wasn't always the case. The movie star not only had to wear an incredibly annoying wig to take on the Norse god, he also had to gain 20 lbs. of muscle, which was far from pleasant. So, how did he do it? By overeating … a.k.a. the American way. See? He's fitting in just fine in the States. Hemsworth committed himself to consuming a constant stream of food — a dream in concept but pretty terrible in actuality. It's not like he was chowing down on ice cream. The star had to focus his energy on protein-packed foods and fibrous fruits and vegetables. "I feel as if I've been busy, but all I've been doing is eating all day," he told Men's Health (via People). "Eating when you're not hungry and taking in that amount of food is exhausting." 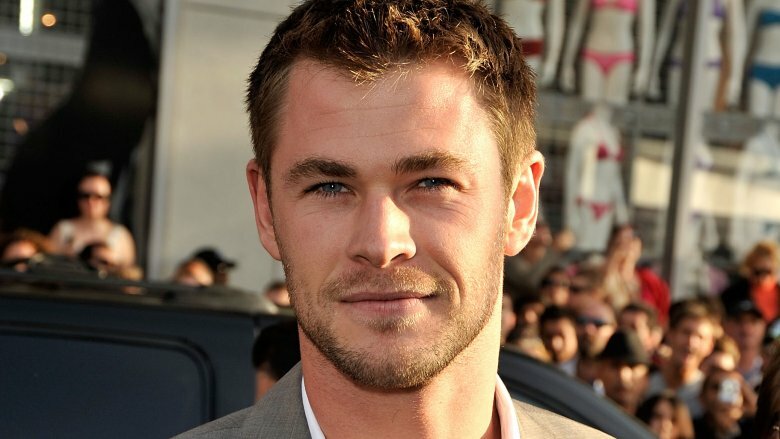 Hemsworth also started lifting weights and completing actual work outs, instead of simply surfing and playing sports. Hemsworth is one of those great actors who will do anything for a role. His transformations adeptly go from one extreme to another. As quickly as the star got used to eating all day to become a hammer-wielding god, he just as easily snapped back his calories to basically nothing in order to look like an emaciated castaway (a page from the Anne Hathaway book of eating oatmeal paste for Les Misérables). In an interview with Good Morning America, the actor revealed that he lost 33 lbs. in four weeks for 2015's In the Heart of the Sea, which was a heck of a lot harder than gaining muscle for Thor. His extreme dieting — which consisted of consuming just 500 calories a day — gave him a "moody existence" and "inconsistent emotions." 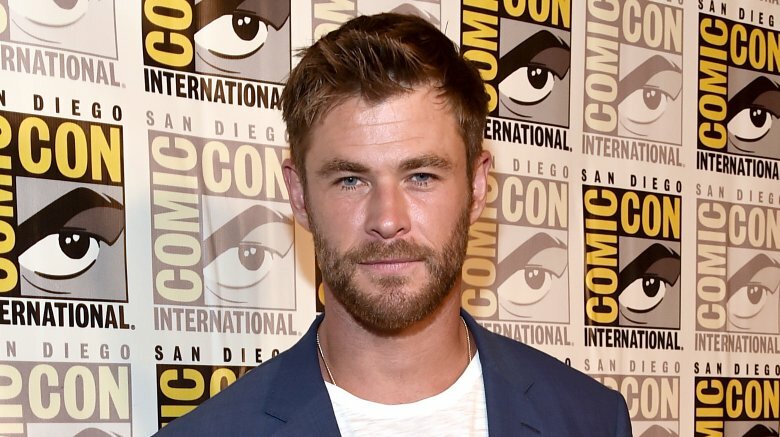 Hemsworth reportedly ate boiled eggs, salads, and "nothing much." Yeah, we'd be pretty moody, too. However, this struggle really helped him portray a man stuck at sea for months. "In order to do it justice, the story, we had to suffer in some way and we did," he said. "It was, in other words, not a whole lot of acting was required. We were desperate." Chris Hemsworth is no rule-follower. What kind of dad would the Aussie star be if he didn't try to give his daughter, India Rose, the best Disneyland experience possible? Probably one where his daughter was just a teensy-tiny bit safer. In an interview on Jimmy Kimmel Live, the Avengers: Endgame star admitted that he became his daughter's "hero" when he snuck her onto the Tower of Terror, which notably became the Guardians of the Galaxy ride in 2017, according to the Los Angeles Times. To help boost her height, Hemsworth shoved "a couple of Snickers bars and things" into the back of her shoes — an instant lift that came with consequences other than the fact that they probably had no more candy bars to eat in the California sun. Things didn't really go as planned, because those height restrictions are there for a reason. His daughter rose out of her seat during the big drop, and the action hero star ended up having to hold her in her chair the whole time. Whoops. Liam Hemsworth's relationship with Miley Cyrus has always been subjected to tabloid speculation. It's almost a miracle that the pair managed to wed in secret, no thanks to big brother Chris. During an interview with Britain's This Morning (via ET Canada), the Thor star admitted that he nearly blew the lid off the whole thing when private photos he took at the ceremony ended up in the wrong hands. Chris Hemsworth brought a film camera to the Tennessee nuptials, and anyone who's ever tried to get film developed in 2019 knows it's no easy process. Though the actor had been using the same photo spot for years, the shop accidentally sent the Dropbox link of the more than 200 wedding pictures to a 21-year-old stranger named Elvira Nordstrom, who went on Instagram to let everyone know what had happened. For his part, Hemsworth was terrified the pictures would be leaked. "This girl put it on Instagram. Then someone told me. I got a phone call with her number and I contacted her," he told This Morning. "She couldn't be kinder. They're safe. That was a big relief. It could have gone the other way."